(Online Interactions Not Rated by the ESRB) The Games on Demand version supports English, French, Spanish. It’s called The Run. An illicit, high-stakes race across the country. The only way to get your life back is to be the first from San Francisco to New York. No speed limits. No rules. No allies. All you have are your driving skills and sheer determination as you battle hundreds of the world’s most notorious drivers on the country’s most dangerous roads. In Need for Speed The Run, you’ll weave through dense urban centers, rocket down icy mountain passes and navigate narrow canyons at breakneck speeds, all the while evading a relentless police force prepared – and willing – to use lethal force to take you down. The Signature Edition Booster Pack gives you exclusive access to 9 iconic cars, with a twist. Each car has been customized and tuned to perfection to give you an edge over the competition. Use these unique cars to your advantage in The Run and to beat your friends online in high octane multiplayer. Download the Signature Edition Booster Pack December 20, 2011. Are you ready for the most accessible online racing experience ever offered? Need for Speed The Run is offering matchmaking technology so you can join races already in progress instead of waiting in lobbies. Create a party with friends, pick a playlist of your favorite challenges and compete for supremacy across every stage of The Run. By mastering all of the playlists you can level up and earn access to exclusive vehicles, upgrades and abilities. Experience an action-packed, coast-to-coast race for your life, all through the eyes of Michael Bay. Get ready to race for your life. In stores now. From the Golden Gate to the Empire State — Compete in The Run, an illicit race across the most iconic and treacherous roads from San Francisco to New York. There are no rules and no allies in the cities, deserts, mountains and canyons that stand between you and the finish line. Watch the new Need for Speed The Run trailer featuring never before seen gameplay footage and the new single, "Lonely Boy" from The Black Keys. Powered by the new Frostbite 2 game engine, Need for Speed The Run takes you on a heart-pounding coast-to-coast race from San Francisco to New York. 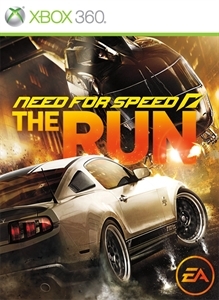 Need for Speed The Run will be available November 15, 2011 in North America and November 17, 2011 in Europe. Leaving Colorado means one thing, traveling down the Million Dollar Highway. Steep cliffs, hairpin curves, narrow lanes and a lack of guardrails make this route hazardous to even the safest drivers. But with $25 million at stake and your life on the line, being safe is the last priority. You have to thread through traffic and pass your rivals at 10,000 feet, but racing on the edge means being fearless and aggressive. On Oct. 18 race for your life for only two week in The Run demo. You start in the Desert Hills of Nevada where you find yourself at the heart of the pack. Battle the unforgiving desert heat and technically demanding terrain as you use your skills to fight your way to the front of the pack in the Lamborghini Gallardo. Once past Vegas you face a treacherous shortcut in Independence Pass. But the clock is ticking, a mountain is crumbling in front of you and a rival is one step ahead. Refer a friend and be the first to experience what it’s like to be behind the wheel of the 2012 Porsche 911 Carrera S.
Need for Speed The Run is taking swimsuit models Irina Shayk and Chrissy Teigen off the beach and putting them behind the wheel. Irina, the 2011 SI Swimsuit Edition cover model, will play Mila Belova, a rival racer after the $25 million prize. Chrissy, 2011 Swimsuit Edition model, will play her lifelong friend Nikki Blake who’s also racing for the jackpot. The two will prove to be some of your toughest rivals as you battle them and 200 others to make it to New York first. Meet Jack. Jack is a marked man. But Jack has just found a way to save his life. All he needs to do is win a cut-throat coast-to-coast race from San Francisco to New York: The Run. No speed limits. No rules. No allies. The Run features some of the toughest driving terrain the U.S. has to offer. Dense city streets, icy mountain passes and narrow canyons will push Jack’s driving skills to the limit. Relentlessly hunted by police, as well as the men who want him dead, Jack is racing for his life. Who wouldn’t want to drive this year’s most highly anticipated car? The 2012 Porsche 911 Carrera S has been officially unveiled and Need for Speed: The Run is giving you exclusive access. Experience the raw power and pinpoint handling that 500 horsepower and 800 lbs of torque have to offer as you fly past rivals and slip past obstacles on your way to New York. The Porsche 911 is only available in the Limited Edition, so pre-order now. NEED FOR SPEED™ THE RUN: Buried Alive makes you face a life-threatening choice in Colorado. Take the long route and lose valuable time, or ignore the warnings and use your skills to survive a treacherous shortcut. With a rival on your tail, and the clock ticking, the choice is obvious. Race for your life. NEED FOR SPEED™ THE RUN: Limited Edition is here! You're in a battle for your life and going to need every advantage you can get. Need for Speed The Run Limited Edition gives you access to exclusive challenges as well as the ultimate head start with three elite cars: The Lamborghini Aventador, Chevrolet Camaro ZL1 and the all new Porsche 911 Carrera S . Now that you have your elite cars, you can put them to the test with the five exclusive Limited Edition racing events. The Limited Edition serves up all new opportunities to battle your friends on Autolog and the chance to master your driving skills while earning bonus rewards and achievements. NEED FOR SPEED™ THE RUN: Run For The Hills streaks through the Desert Hills of Nevada with Jack finding himself at the heart of the pack. Battling with the unforgiving desert heat and techincally demanding terrain, Jack must do everything he can to fight his way to the front. That means precision driving at its best as Jack uses all of his skills to slip through the pack on his way to Vegas. But with so much at stake, no one is going to give him an inch. NEED FOR SPEED™ THE RUN: Teaser Trailer is here! An illicit, high-stakes race across the country. The only way to get your life back is to be the first from San Francisco to New York. No speed limits. No rules. No allies. All you have are your driving skills and sheer determination as you battle hundreds of the world’s most notorious drivers on the country’s most dangerous roads, all the while evading a relentless police force prepared – and willing – to use lethal force to take you down.